Once published exclusively for children, colouring books are starting to find their way from school bags onto the office desks and coffee tables of adults in pursuit of ‘mindfulness’. Prized for its stress-busting abilities, the simplicity and repetitive nature of colouring in is said to stave off negativity and contribute to a state of inner peace. Of course it’s long been known that having furry friends in the family yields many of the same benefits. Much like colouring in, the simple act of stroking a beloved moggy produces a similarly relaxed state-of-mind. In fact, whether they are helping combat the crippling effects of loneliness or filling the air with the soothing sound of contented purring, cats seem to have an innate ability to alleviate anxieties in us humans (see our blog post: A purr a day will keep the blues away). 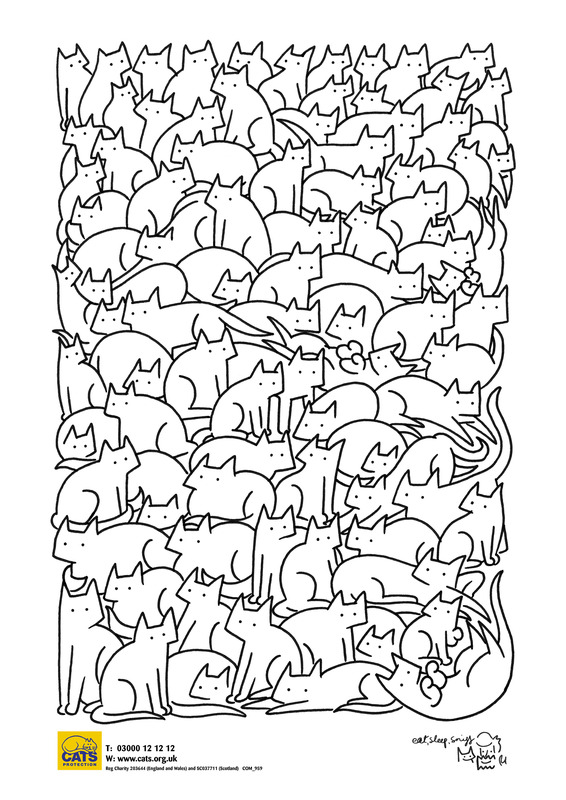 So as it’s Blue Monday, reportedly the most depressing day of the year, we thought we'd prescribe a double dose of tension relief, with a downloadable colouring page featuring a ‘clowder’ of cute cats. Simply right-click on the image below, print it out, grab some crayons and a cuppa and scribble away those post-Christmas blues. Here are some feline-related figures to muse on while you're keeping it inside the lines.